I promise to take better pictures, at the Second Annual* “Let’s Talk About College!” lunch next year. 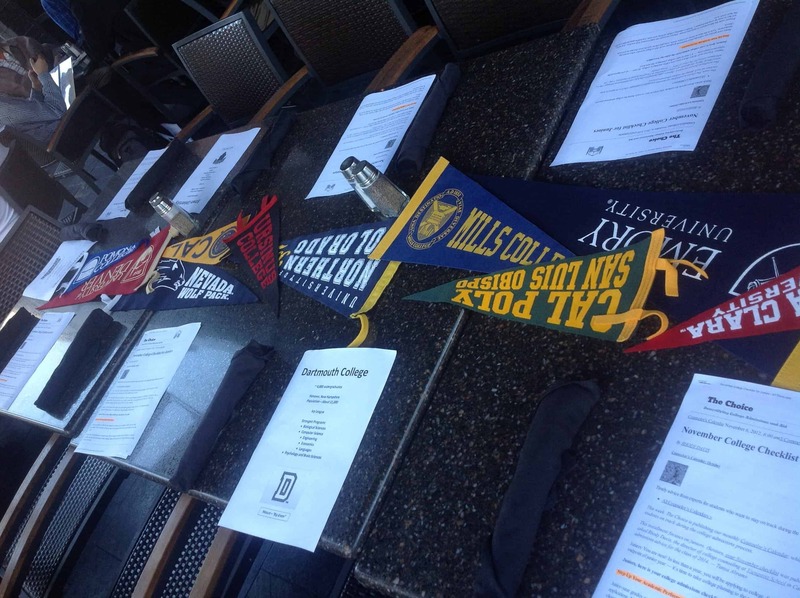 Yesterday, I hosted my Inaugural* “Let’s Talk About College!” lunch for my high school sophomores and juniors. In addition to the six students who came, I invited a few friends who attended different colleges. Not official admissions representatives, or even interviewers – just normal people who can talk about what it’s like to be a student at their alma mater. You can only learn so much from the guide books, the chat boards, the official college website. You can learn more if you visit a campus – in fact, you’ll find that students have an immediate reaction to a school almost from the minute they step out of the car (cab, subway, train, etc.). You’ll learn a lot from the official campus tour. But you’ll only learn exactly what they want you to learn. You’ll learn even more if you talk to real students and real alumni. I hosted this event, and I’ll do it every Veterans’ Day, so that students could mingle with people who have positive things to say about their college experience, and can speak about what college is really like. There were no boundaries – the students could ask whatever they wanted – without fear of someone making note of their question somewhere. By the end of the lunch, they all knew more about Kansas, Lafayette and Brown, and some were interested in looking deeper. I’m reading a book right now called “The College Hook.” You’ve probably heard this term – some people insist that you have to have some crazy hook to “get you into” college. My friend Joel, a Brown University alum, came yesterday, and when he talked about how his B+ average got him into the Ivy League, he referred to his extra-curricular activities. “Just be awesome,” he told the students. It’s actually great advice. Just do one thing, or maybe a few, but do it really, really well. And learn to write about it in an eloquent way. * An Inaugural event is the first of what will eventually become an Annual event. You see, you can’t call something the First Annual because, well, how can you call it annual if it’s never happened before? There are lots of references out there on the Interwebs about this, but my favorite one is here.